Venue: Kia Oval. Date: Friday, 7 September to Tuesday, 11 September. England have kept faith with the same batsmen for the final Test against India, in what will be Alastair Cook’s last international game. Cook, 33, who holds the record for the most England Test runs with 12,254, announced his retirement from international cricket on Monday. James Vince, drafted into the last squad as back-up for Jonny Bairstow, has been released back to Hampshire. England have already won the series and lead 3-1 after their Southampton win. Opening batsman Keaton Jennings remains in the squad despite only scoring 130 runs in the series, at an average of 18.57, while Cook has only scored 109 runs, averaging 15.57. Ollie Pope will play for Surrey in the first two days of their County Championship Division One match against Essex at Chelmsford and will join the rest of the Test squad on Thursday morning. England will have to decide who bats at number three after captain Joe Root batted there in the first innings of the fourth Test, before Moeen Ali took that position for the second innings. It also remains to be seen who will keep wicket, with Jos Buttler having stepped into the role in Southampton because Jonny Bairstow was struggling with a fractured finger. Chris Woakes is included after missing the last Test with tightness in his quad. 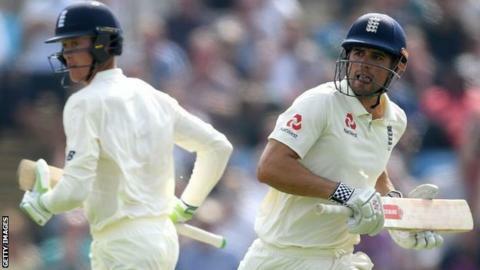 England won the opening Test by 31 runs at Edgbaston and then moved into a 2-0 lead with a victory by an innings and 159 runs at Lord’s. India took the third Test by a 203-run margin before England clinched the series with a 60-run win at Southampton. Joe Root (Yorkshire, captain), Moeen Ali (Worcestershire), James Anderson (Lancashire), Jonny Bairstow (Yorkshire), Stuart Broad (Nottinghamshire), Jos Buttler (Lancashire), Alastair Cook (Essex), Sam Curran (Surrey), Keaton Jennings (Lancashire), Ollie Pope (Surrey), Adil Rashid (Yorkshire), Ben Stokes (Durham), Chris Woakes (Warwickshire). ← Previous Story What made 'super man' Cook an icon – and is he irreplaceable?